Rodney Earwood and Palmer Cray had been best friends for as long as either could remember. They were brothers in all but the genetic sense, each born late in the lives of good women who had given up on the dream of motherhood by the time their respective miracles occurred. They wandered the hills of North Georgia, hunted the pine woods, fished the cool, green streams, and camped under the stars. They shared each other's clothing, each other's families, and each other's homes. They grew into tall young men, and on a hot May afternoon right after they turned eighteen, they both graduated from Sweetwater High School, numbers seven and eight in the crooked, sweaty line that held a class of thirty of Sweetwater's finest. Shortly thereafter, Rodney and Palmer flew a Camaro into a tree, Palmer flew into a haystack, Rodney flew into the great beyond, and nothing in Sweetwater was ever the same again. Follow Palmer in the aftermath of his one great mistake as he confronts regret at his own fallibility, endures punishment for his actions, finds unexpected redemption in unusual places, and is given a second chance to try to make it all right. He is joined in this journey by an unlikely cast of associate--including a methamphetamine dealer named Cheddar, a junkyard owner named Ottis Lee, a coffee-can addict named Bay-Annette, and an Alzheimer's patient who was once Rodney's mother--as they face each day and try to overcome their Sweetwater Blues. This book also available in e-book format through Amazon, Barnes and Noble, and Kobo. I am late to the party celebrating Raymond L Atkins as a talented author, but at least I have arrived. I became aware of this author when his first book The Front Porch Prophet was published but I didn't sample his work until his third book Camp Redemption came out. That book impressed me with the author's way with words but his humor and plot structure eluded me. Therefore I picked up his latest Sweetwater Blues with trepidation. This new novel once again impressed with the undeniably beautiful descriptions of people and their settings. Atkins writes with watercolor words and fills his book with pictures that create a total world for the reader. Once again the plot was slow to grab me but by the third chapter I was caught up in its rhythm and flow. When I begin to see the book as a series of incidents and not a linear plot driven piece I was able to relax and feel its power. The main character is Palmer Cray, a young man who has a good heart and good intentions but he has made some mistakes in his life. He is paying for them with a ten year sentence in Sweetwater Prison. One of his worst mistakes involved drinking and driving and this resulted in the death of his best friend Rodney Earwood. His death haunts Palmer and leads to his quest for redemption. What this redemption can be is a quandary for Palmer. He tries to analyze it all but ultimately finds that his heart knows more than his head. His natural instincts lead him to acts of ineffable grace. Reading about them the reader is mesmerized by their power, and humbled by their honesty and beauty. It has been a while since we have had a hero with the strength of character possessed by Palmer Cray. Atkins writes about the ordinary man and lifts him up by his ethics and morality. He does not create idyllic characters but rather gives us the ordinary presented in extraordinary ways. It is impressive to behold and makes the reader feel better about humanity overall. Atkins previous novel was called Camp Redemption, and this book could have been titled Redemption. He seems to have a theme going here. Hopefully he will expand on it even more in the books that follow. He is one of those rare authors who can glorify the good without being saccharine. The party for Atkins' talent continues. Come join me at the table. Told with the sureness and wit of a modern-day Mark Twain, Sweetwater Blues stakes its place among American classics. Thank you, Raymond Atkins, for taking me on a coming-of-age journey every bit as hilarious, honest, bittersweet, and wise as that of Huck Finn on his raft—and from a prison cell, no less. 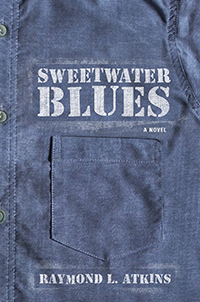 Sweetwater Blues is a compassionate novel that asks the reader to go beyond the headlines on the nightly news to the human story. Atkins created a brilliant character in Palmer Cray, who insists the reader suspend his or her judgment and listen to what he has to say. Like an Otis Redding tune, Sweetwater Blues will seduce the willing. Raymond Atkins is one of Georgia's natural wonders—a crack-wise writer, who invokes laughter and invites imagination. Sweetwater Blues isa frolicking good read, sure to be a hit among convict book clubs nationwide.